We are excited to announce our last workshop for the year. Basically it will be a summery of the whole year’s work that was discussed. The reason we started with the workshops is that we saw that home owners were being taken advantage of in the building industry. All the relevant information is out there but people don’t always know where to look or even what their rights are. That is where the workshop come in. People can ask the questions and obtain the relevant information before they even think of appointing their professional team. – How to find your professional team and suggested contracts to use. – What to expect from the the architectural process. 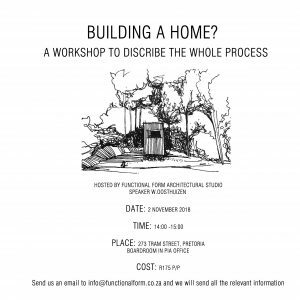 – Why should you appoint an architectural professional during the construction phase? The workshop also include a starter pack that will assist the owner until they have appointed their team and they will take over from there. Building a home or any project for that matter is a big step and anything worth while doesn’t come easily that is why you should have a proficient and reliable team behind you.